Our School council is the students’ voice. We work together to make the school a better place. We meet once every half term, to discuss points that have been brought up by the year councils. Each form elects two year council reps who meet once every half term with their Head of Year to feedback and discuss their year group’s concerns and ideas. Then two members from each year council are nominated to represent their year at the school council meeting. The school council meet with Mrs van Teutem, Miss Sydney and Mrs Goodwin (school governor). Minutes are taken and action notes recorded and allocated to members to implement. Mrs Goodwin reports important matters to the governing body at their half termly meeting. Many changes and innovations have come about through the work of the School Council. Past achievements which we are particularly proud of are the new Canteen Servery; The Dalo building, which provides indoor space at lunch time; the re-design of Hydeswood lawn, to provide a better outdoor environment for that area. We also introduced picnic benches, to allow more eating space and improved the link block toilets. All ideas that have come from students! We are consulted on many matters, such as the appointment of the new Headteacher, curriculum changes, dress code, ways to encourage attendance and behaviour and contact books. 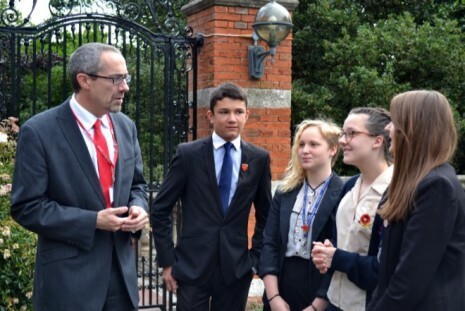 Student leaders attend governors’ meetings and get a real insight into the running of a school. There are opportunities for student councils to meet with other student councils to discuss local and national issues. Each year group will participate in the Bromley youth manifesto event, which is linked to the BYC (Bromley Youth Council.) Bullers Wood students have become members of the BYC and have taken part in meetings at the Houses of Parliament. Each term the school council has representatives speaking at both year and main school assemblies updating the students and promoting student voice. If you have any other ideas or issues that you would like the school council to discuss please speak to any of the council representatives who will forward your thoughts to the council.